I am forever starting a new diet or style of eating. I’ve had much success with some and flat out failure with others. You’d think I’d learn that sensible eating would be the way to go. Now I have a way to do that without a huge hassle. The EatSmart Precision Pro Digital Kitchen Scale is an easy to use, versatile kitchen scale. It is very accurate. I let me 7 year old test it by weighing different items. It can weigh items up to 11 lbs! You can use it with four different displays grams / ounces / pounds / kilograms. This made it nice to use for liquids as well as solids. I love that it has a tare or zero function. 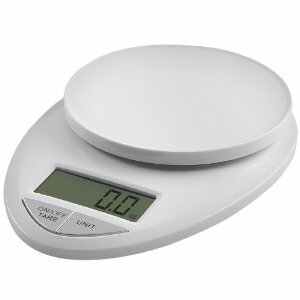 You can set your plate on the scale hit zero and it eliminates the weight of the plate for easy measuring. The screen was easy to read and simple to use. I had a much higher tech scale that took me 5 minutes to figure out every time I wanted to weigh something. I gave up using it after 3 tries. I won’t have that problem with this scale. The EatSmart Precision Pro Digital Scale has some other features cooks will like. There is a three minute auto-turnoff. It’s nice because if you forget the measurement you just used you have three minutes before it will shut off. The scale is very accurate and measures to within .05 ounce or 1 gram increments. It comes with a EatSmart Calorie Factor book that helps you count calories if you are dieting. This is nice because you can actually see what a real portion size is supposed to be instead of just guessing. I loved that this scale uses batteries instead of a cord. I have a tendency to want to leave things plugged in if they have cords. This allows me to put it away and take it out easily. Great for storage. This scale will be around a long time in my kitchen and I’m thankful I had the opportunity to review it. I was given a EatSmart digital scale for review purposes. I was not financially compensated for this review and this is my honest opinion.